Is Microwave Popcorn Safe for Children? Popcorn is often viewed as the quintessential snack of choice for any movie lover. When the kernels are popped to perfection, it becomes the best accompaniment to the latest episode of your favorite show. It’s a great alternative to sugary snack options for children as well. The quickest option is to drop a bag in the microwave and listen as the kernels pop to completion. However, new research has shown the microwave might not be the safest option for food preparation. Does this extend to microwave popcorn? An occasional treat is fairly safe, but if you frequently consume microwave popcorn, there are some facts you should know. The health and wellness of your children is of the utmost importance, so have all the facts in order to make the best choice for them! The store-bought bag has a chemical called diacetyl, which is naturally occurring and safe to ingest. This chemical is what gives microwave popcorn the buttery taste and enhances the flavor. However, if you or your child inhale the sweet aroma of popcorn too often, you might have cause for concern. But to be affected, you’d need to eat several bags a day and inhale the aroma every time. What Happens if you Inhale Too Much? Recently a new medical phenomenon occurred when a man in Colorado contracted “popcorn lung.” The truth about popcorn lung is in the medical diagnosis of bronchiolitis obliterans, which is a severe respiratory disease. This disease has been linked to inhaling significant amounts of the diacetyl chemical in the popcorn bag. Factory workers are most susceptible to contracting this, but the Colorado man frequently exposed himself to the aroma. Due to high levels of consumption and inhalation (an average of two bags a day for ten years), he had significantly increased the likelihood of contracting popcorn lung. 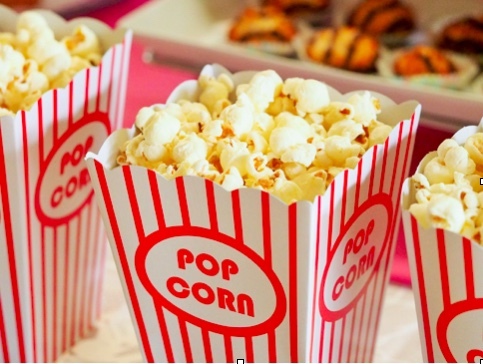 Monitoring your child’s intake of popcorn can significantly reduce the likelihood of contracting popcorn lung. Are the Companies Doing Anything About It? After popcorn lung surfaced, many manufacturers took the discovery to heart and changed their practices. Act II, Jolly Time, Pop Secret, Orville Redenbacher, and Pop Weaver have since removed the use of diacetyl in their popcorn and bags. This makes it safer not only for your family, but the workers as well. If you want to take an extra step on your own, simply wait until the bag is cool, allowing the vapor to condense before opening it. Remember, the harmful effects of the chemical are in the aroma! In addition to diacetyl and the potential of popcorn lung, the bag itself is also lined with other substances that can be harmful to children in the long run. Most popcorn bags are lined with perfluorooctanoic acid, the same kind found on Teflon pots and pans. When heated, as it is when you put the bag in the microwave, the chemical can be tied to cancer and other diseases. While there are currently no long-term studies of this effect, the EPA has listed this acid as a carcinogen. Microwave popcorn utilizes various oils and emulsifiers that require GMO ingredients. Again, there are not long-term studies on the health risks of GMOs, but it is part of a rising issue of health concerns. Since most brands are typically not organic, pesticide use is all but guaranteed. Additionally, some brands utilize trans fats, a fat linked to heart attacks. While this might not be a concern for children at their young age, if microwave popcorn becomes a habit, it could be an issue later on in life. Fortunately, there are many alternative options to microwave popcorn. It can be a fun snack time activity as a family! To avoid the health concerns, just try making it yourself! There are a lot of recipes out there that just require oil, popcorn kernels, salt or butter, and a pot with a lid. If popcorn is especially important to your family, you can invest in an at-home popcorn maker, ideal for creating your own kind of popcorn.